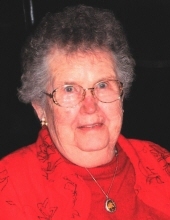 Grace Julia Ann Anderson, 98 of Casey passed away on Friday, February 8, 2019 at the Guthrie County Hospital in Guthrie Center. Funeral service will be held at 11 A.M. on Wednesday, February 13th at St. John’s Lutheran Church in Casey. Visitation will be one hour prior to the service at the church. Burial will be at Oakwood Cemetery in Casey. Memorial contributions may be directed to the Casey Library and/or St. John’s Lutheran Church and may be sent in care of Johnson Family Funeral Home, PO Box 246, Stuart, IA 50250. Online condolences may be left at www.johnsonfamilyfuneralhome.com. Grace was born on January 4, 1921, to Carl and Helen Stolk. She grew up on a farm about a mile east of Casey and graduated from Casey High School in 1939. On October 13, 1940, Grace married Gunnar Anderson, and a year later they moved to Los Angeles, California. Gunnar enlisted in the Army Air Corps, and Grace got a job with Vega Aircraft Corporation, checking the wiring on B-17s. In 1946, Gunnar and Grace moved back to Iowa, settled on a farm two miles east of Casey on the county line, and raised three daughters. Grace was also co-leader of the Thompson Homemakers 4-H Club for 13 years and a longtime member of St. John’s Lutheran Church. As all farm wives do, Grace worked beside Gunnar every day, and when she asked him who would run the farm if he died, he always answered, “You will.” After Gunnar’s death in 1992, Grace successfully did just that. Although she sold the farmhouse and moved to Casey in 1997, Grace still owned the land and took an active interest in the farm until the day she died. Grace is survived by her three daughters, Gloria Andrews, Gail (Vern) Huber, and Glenda (Tom) Spragg; eleven grandchildren; and six great-grandchildren. Preceding her in death were her husband Gunnar, her parents, her brother Willis, her sister Gladys, her son-in-law Robert Andrews, two nieces, and one nephew. Mom was a loving wife, mother, grandmother and great-grandmother. She was a determined, independent woman with a feisty spirit who had a smile and a kind word for everyone. She taught us everything we know about living a good life. We love her very much, and we will greatly miss her. To send flowers or a remembrance gift to the family of Grace Julia Ann Anderson, please visit our Tribute Store. Luncheon will follow the committal service at the cemetery. "Email Address" would like to share the life celebration of Grace Julia Ann Anderson. Click on the "link" to go to share a favorite memory or leave a condolence message for the family.